Media briefing by Setia Haruman Sdn Bhd Chairman Tan Sri Datuk Haji Mustapha Kamal bin Haji Abu Bakar. From Left to Right: Tan Sri Datuk Haji Mustapha Kamal bin Haji Abu Bakar, COO C.K. Lao and Head of Business Development Pipah Mohd Nasir. - THE STAR/Low Lay Phon. CYBERJAYA: Master Developer of Cyberjaya, Setia Haruman Sdn Bhd, is investing RM2.5 billion over the next five years to develop four mixed residential projects in Cyberjaya, dubbed an “Intelligent City”. Chairman Tan Sri Mustapha Kamal Abu Bakar said the projects, namely CBD Perdana 3 and 5, APEX Residence and a proposed mixed residential development will be riding on the “New Wave” development of Cyberjaya. Setia Haruman would also build infrastructures such as roads and drains, water reservoirs, drainage systems, sewage treatment plants and fibre optics to service and support the “New Wave” development till 2016. The concurrent investment and involvement of these developers have created a “New Wave” in Cyberjaya, resulting in a residential and commercial boom. This “New Wave” is expected to continue over the next five years, with the population to double to 100,000. “Property prices in this city has appreciated by 30 per cent over the last two years and early investors have enjoyed substantial gains. “With the many developments being undertaken by various developers, we expect Cyberjaya to be transformed from a development hotspot into a vibrant city of the future,” he said. 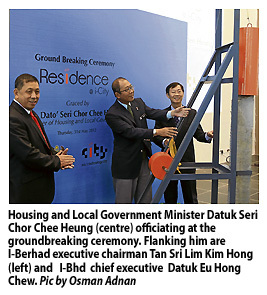 I-t’s launched: I-Bhd executive chairman Tan Sri Lim Kim Hong (left), Housing and Local Government Minister Datuk Seri Chor Chee Heung and Eu (right) officiating at the ground breaking of i-Residence at i-City in Shah Alam yesterday. 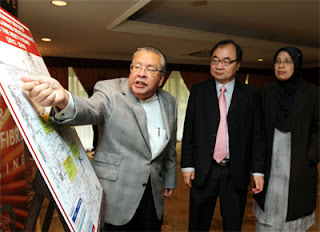 SHAH ALAM: I-Bhd, the master developer of i-City, expects the residential segment of the information, communication and technology (ICT) based integrated township development to contribute 30% to its revenue. “We are saying that the residential component is going to be about 30% of the whole of i-City. We hope that each segment will contribute fully to I-Bhd’s bottomline. 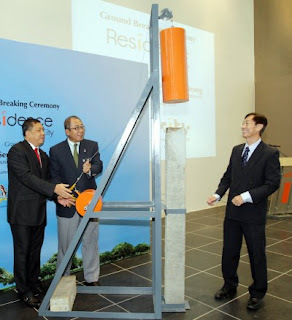 In the long-term basis, we hope that they will contribute one-third each,” I-Bhd CEO Datuk Eu Hong Chew said. He said the gross development value (GDV) of i-City’s first residential block amounts to RM225mil. This is 7.5% of i-City’s total GDV of RM3bil. i-Residence consists of a 33-storey condominium, which has 346 units in two tower blocks, and 20 units of low density exclusive duplex villas. Already 65% of the total units have been sold. The size of the condominium units range from 715 sq ft to 1,357 sq ft while the 20 villas range from 2,400 sq ft to 3,700 sq ft.
i-City will have its own auxiliary force in accordance to the Housing and Local Government Ministry’s “Safe City” concept. Piling works for i-Residence has started and construction is expected to be completed in 2½ years’ time. The remaining build-up space will be launched by year-end. He expects the total development of i-City to be completed in 10 years. “We are one of the very few high-rise developments in the Shah Alam area. The profile shown is that it suits young adults,” Eu said. The universal theme of i-City is “Live, Work and Play”. i-Residence is part of i-City’s “Live” component, while the MSC Malaysia Cybercentre represents its “Work” component. As part of the “Play” component, i-City launched the city of digital lights in December 2009 and subsequently introduced Snowalk and its theme park rides. In a recent report, Kenanga Research said it expected i-City’s real GDV to be close to RM5bil assuming the average selling price hits a high of RM550 per sq ft. The entire development of i-City spans over 72 acres of freehold land. Only 15% has been developed. i-City will launch its water resort by year-end. A direct flyover from the Federal Highway to i-City is currently under construction and will be completed in September. The RM58mil flyover project was undertaken by the Menteri Besar Inc to ease traffic flow to and from the area. Magical Sterling Sdn Bhd, a wholly-owned subsidiary of Glomac Bhd, has proposed to acquire 77.5 hectares of land in Sepang, Selangor, for RM66.821 million, or RM8.00 per sq ft. In a filing to Bursa Malaysia today, Glomac said Magical Sterling has entered into a sale and purchase agreement with Lee Ching Cheng Dengkil Oil Palm Plantations Sdn Bhd for the proposed acquisition. The purchase consideration for the land, cultivated with oil palm trees, was arrived at on a willing-buyer willing-seller basis, after taking into consideration the development potential of the land and the market value of the properties surrounding the area. The proposed acquisition, to be paid wholly in cash from internally generated funds and borrowings, is in line with Glomac's core strategy of acquiring suitable development landbank within the Greater Kuala Lumpur with strong potential for prime and sizeable new developments with high development value. Glomac added it intends to develop a mixed residential development project on the land. 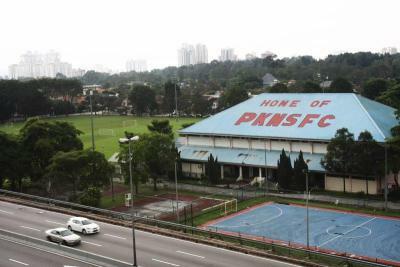 KUALA LUMPUR: Malaysia Building Society Bhd (MBSB) yesterday signed a debt settlement agreement for RM120 million with Twin Pavilion Development Sdn Bhd to revive and complete the Pantai Plaza project in Bangsar here. MBSB chairman Tan Sri Abdul Halim Ali said the agreement will settle the debts of Atlas Corp Sdn Bhd, the project's previous developer. Twin Pavilion Development has taken over the project, now called Bangsar Trade Centre (BTC). Speaking to reporters after the signing ceremony, MBSB president and chief executive officer Datuk Ahmad Zaini Othman said the group will extend a RM120 million end-financing assistance to the project's purchasers. Twin Pavilion Development chief executive officer Lee Seng Khoon said construction will begin in August and will be completed in three stages beginning August next year until December 2014, with the completion of the BTC wholesale mall, followed by the business suits and corporate office tower. Twin Pavilion Development chairman Tan Sri Ramli Ngah Talib said BTC will cover 1.4 million sq ft of purpose-built business space, with a RM850 million gross development value and is expected to welcome about 10,000 people daily. Federal Territories and Urban Well Being Minister Datuk Raja Nong Chik Raja Zainal Abidin, who launched the BTC project, said more sites will be identified for redevelopment as the momentum for urban renewal has accelerated under the government's Economic Transformation Programme to reach its full potential. "There is no doubt that parts of Kuala Lumpur will need urban renewal in the years to come. "This is in addition to the areas identified for redevelopment under the Greater Kuala Lumpur project," he said. Raja Nong Chik said Pantai Plaza's restoration is timely and in line with the upcoming development within the vicinity. "I am sure KL residents, especially from Pantai Valley, will look forward to BTC's completion as it captures their imagination of what an integrated development in this location should be standing tall as a new entry to the place," he added. PETALING JAYA: A Daiman Development Bhd property in Johor Baru is set to become part of the Hilton Hotels & Resorts stable. In a statement to StarBiz yesterday, Daiman Development clarified that the management agreement signed on May 28 by wholly-owned Daiman Landmark Hotel Sdn Bhd and Hilton of Malaysia LLC is for Hilton to provide development services and to operate a hotel owned by Daiman Landmark Hotel. The hotel will be run under the ‘DoubleTree by Hilton’ brand. Hilton of Malaysia is an affiliate of Hilton Worldwide Inc.